We’re happy to be documenting the stories of the “Clean 13,” a project by the Georgia Water Coalition to highlight the extraordinary efforts on the part of businesses, industries, local governments, non-profit organizations, and individuals to protect the water and natural resources of Georgia. Thirteen videos, about 90 seconds each, premiered at the Clean 13 Celebration event in March 2019 to honor the winners and are now online (see the videos). I think we were talking about our experiences of coaching youth baseball. Hence the serious demeanor. 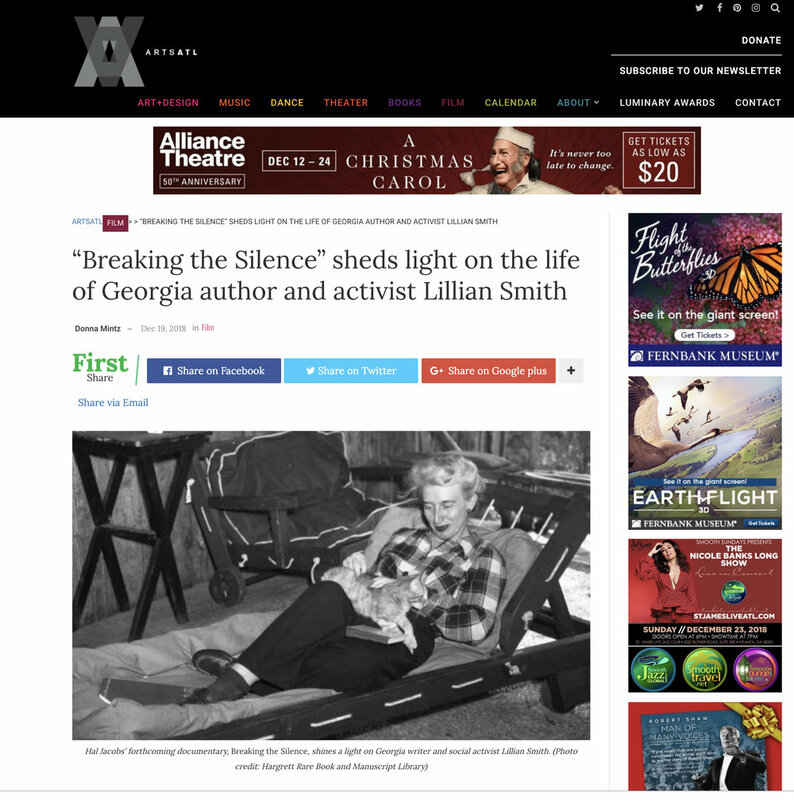 Just received a great holiday gift — the first writeup about the forthcoming Lillian Smith documentary from Atlanta artist/writer Donna Mintz. She and I sat down at my computer to look at a very very rough cut, and she captured the essence of what we’re trying to say in our narrative. Smith’s writings certainly stand on their own. But when you see her work in the context of her life, it can’t help but deepen one’s respect and appreciation for what she did. Met a lot of dedicated volunteers and staff members while working on this video to promote Chattahoochee Riverkeeper's Neighborhood Water Watch program. You can learn more about the program here. It was also my visit to Cascade Springs Nature Preserve (backdrop below). What a spectacular little park. After warming up with three short-doc screening events at Avondale Towne Cinema, we're holding our first "short" short doc festival on February 5th. Awards go to the top three films and the audience will choose a favorite as well. Please drop by if you're in the area. Doors open at 6pm. Screening & Awards from 7:00-9:00 pm. Top Three (3) films receive judges’ awards. The audience will choose an Audience Favorite. “What So Proudly We Hailed,” Duane Saunders Jr.
Special thanks to Tony Longval at Avondale Towne Cinema for hosting the festival! With the collaboration of my younger son Henry Jacobs and my friend (and commercial photographer) Joe Boris, we've started organizing bi-monthly film screenings at a 1920s movie theater in Avondale Estates, Ga. We don't have a mission statement (thank God),* but we are screening short documentaries around different themes (e.g., water, work, politics, adoption), and we're organizing a film festival in February 2018 that will hand out awards and those little laurels you see on award-winning films. This really feels like a golden age of documentaries in terms of getting the right equipment into the right hands of people who want to tell a good story. So we happy to help get the word out. *Okay, if we had a mission, it might be to entertain, enlighten and energize our community with soulful films about the South. Very gratifying to win the Best Documentary Award at the spring 2017 Southern Shorts Award Film Festival in Roswell, Ga. The seasonal festival is on Film Freeway's top 100 list of national/international festivals and the unique thing about this festival is the scoring system... a 100 point system which increases the objectivity tremendously. Three judges per every film AND you get a written critique from each judge. And the award ceremony was a lot of fun for everyone. Filming Maggie Koerner in action at Eddie's Attic last month was a great chance to see Maggie do her thing... which I find incredible... and work with my son, Henry Jacobs, who also filmed (using our new Panasonic GH5's) and edited.